45 Person has expressed his thoughts, Now you turn guys! This is the old Dhetemplate template right? Is amazing..Good work guys! Sy udah install Template-nya. Dan Featured Content udah bisa. owh thnx i get it. but how to change dropdown menu? Hi can anyone teach me how to change or delete the dropdown menu in this template?Thanks! 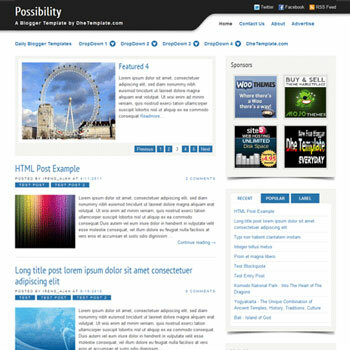 The template shows on the frontpage only 3 posts no matter what number is applied in the blogger post settings ! How do you remove "Continue reading.." completely? If this way still can not work, try to instal another template from Template Designer. Then reinstall again. I used your tip to remove the "continue reading" but it did not expand my blog post to show the whole post! do you know how to fix this? Hi Ann : This template use auto read more. Follow these steps to remove it. hey author i dont want featured widget how to? I am using this nice designed template for my personal use. It is great. However, I wanna remove multi-tab in the sidebar. Anyone know how to do it. Please kindly help me. Thank you for this template. Permit to use this in my blog. hi ireng...blog saya terlihat bagus sekali memakai template ini tapi saya tidak senang dengan widget atribut blogger ( diberdayakan oleh blogger) bagaimana caranya agar widget itu bisa di taruh di bawah atau kalau bisa di hapus tanpa harus instal ulang lagi templatenya. hi ireng ... my blog looks great wearing this template but I am not happy with blogger widget attribute (powered by blogger) how can I make widgets that can be put down or that can be deleted without having to reinstall again the templates..
kak, cara ganti warna headernya gimana..?? I'm getting unnecessarily the tables over my images and text on some pages.I dunno why this is happening.I tried to solve but i couldn't.So now i'm seeking your help. Please look at the below pages and give me a solution. Hello...please reply for my comment. Hi! Is there a way to get the featured content to autoupdate with last posts? hi ireng_ajah,how can i add left sidebar in this template? can u help ..